A couple of years ago I bought an old secretary style desk at an estate sale. And - in my typical style - I put it in the garage to rest a little bit. Last spring, when I organized the garage I moved it to the front of the line of projects to be done. But somehow it still didn't get any attention. Until a few weeks ago when I decided enough was enough! So I took it apart and started cleaning it up. It was a bit of a mess. 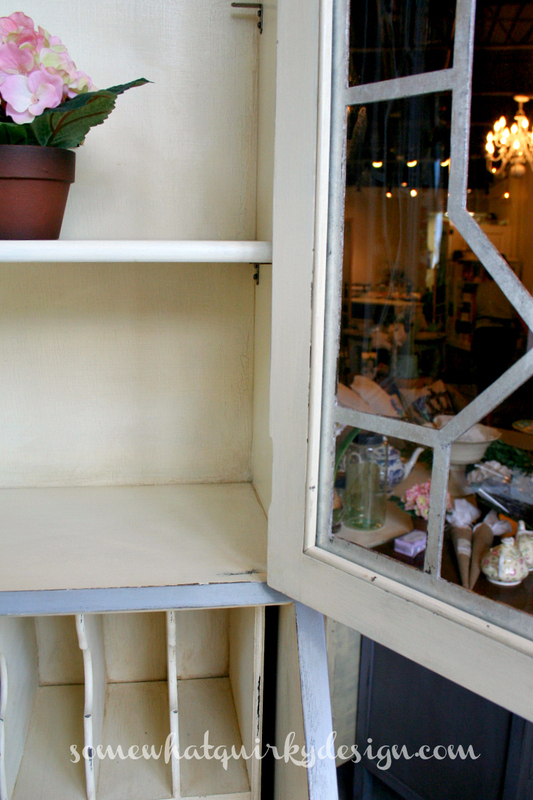 Whenever you have a piece of furniture with glass doors there will be strips of molding holding the glass into place. If you gently take this molding out with a tiny screwdriver you can remove the glass and make it a lot easier on yourself. 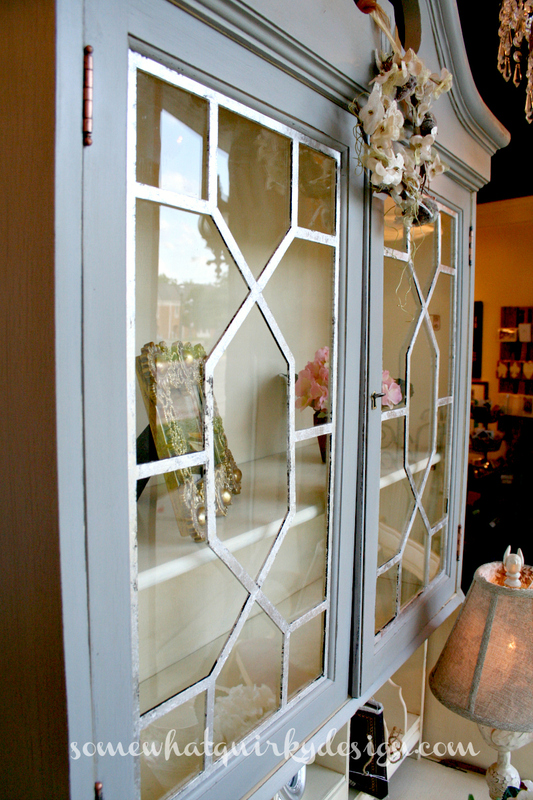 Especially if there is fretwork in front of the glass. 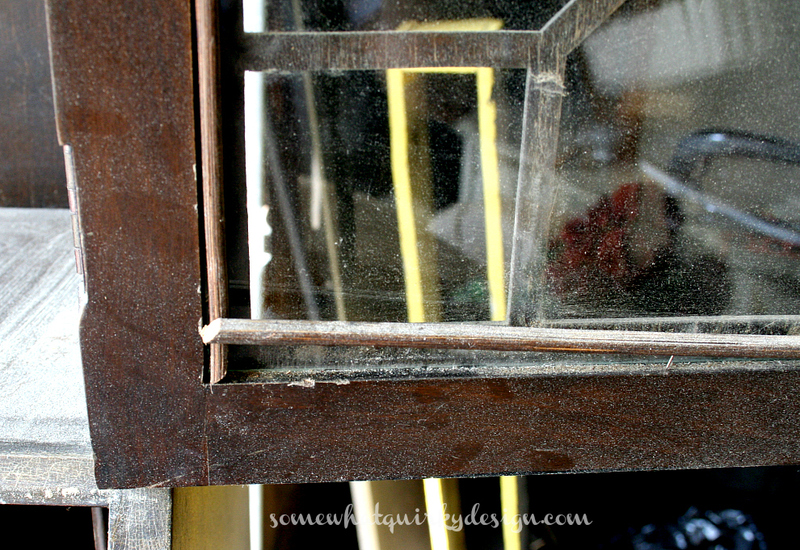 You do NOT want to be painting around this stuff with the glass inside the door. Then take that glass and put it away somewhere safe. Because nothing makes you madder than having to replace glass when you had perfectly good glass to work with. After I took it all apart I cleaned it with mineral spirits. 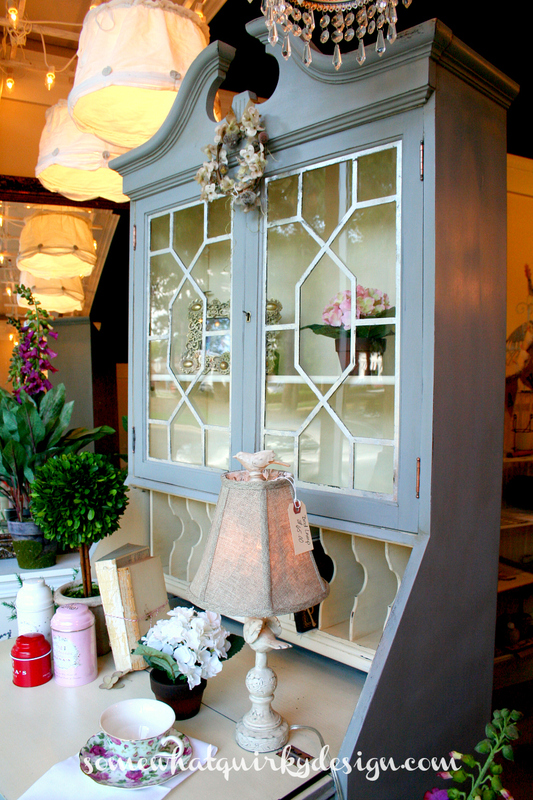 My plan was Chalk Paint in Paris Grey on the outside and Chalk Paint in Old White on the inside. I started on the inside first. Can you say bleed through? It was definitely the worst on the back panel. I find that sometimes the cheaper woods and "filler" wood panels are the biggest problem when it comes to bleed through. So I went to the store and got some Zinsser Clear Shellac and shellacked that sucker. 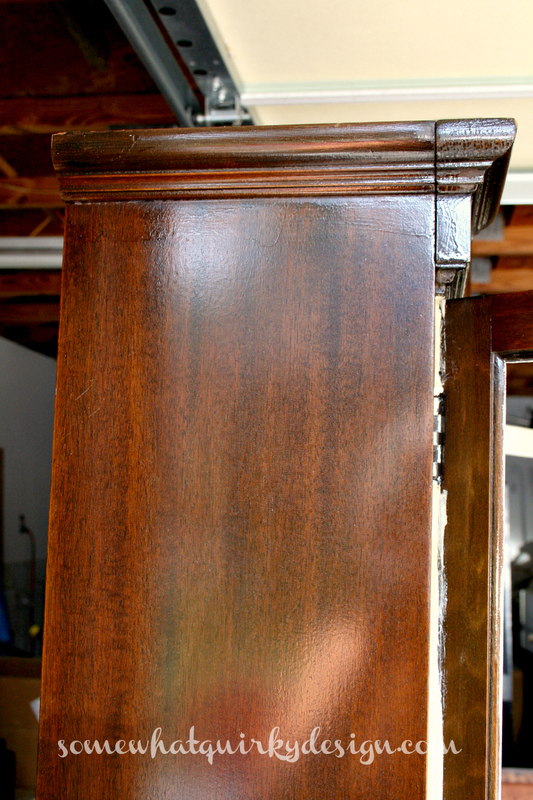 And looking at it shellacked, I could tell why furniture owners of the 50's were so enamored with shellac. Wow! It looked a lot better with shellac on it. The shellac did it's job. It stopped the bleed through. Could I just say that it is NOT fun to paint in those little mail cubicles inside the desk? If I ever do another desk like this I will remove the wood backing from the piece so that I can access the cubicles from the front and back. I feel sure that it would be A LOT easier that way. Once I got the inside done, painting the grey was a piece of cake. Then I used Caramal Colors Antiquing Glaze over the whole piece. 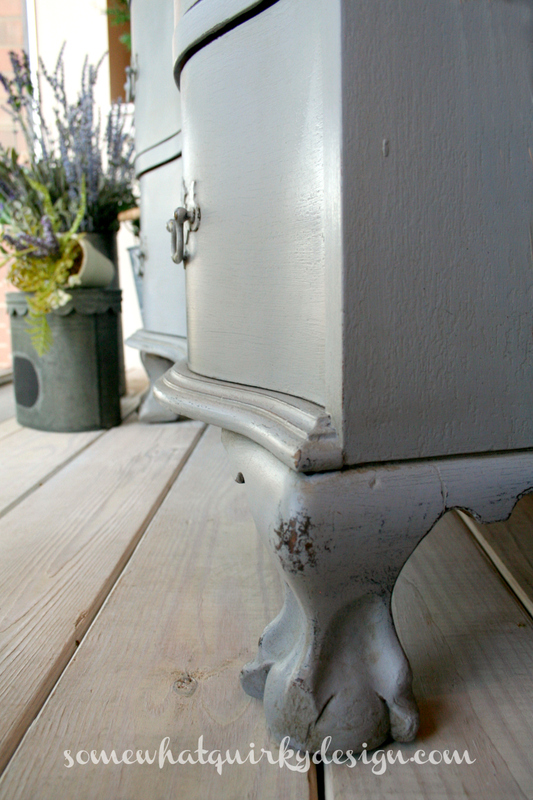 The whole piece was waxed with Annie Sloan Clear Wax. 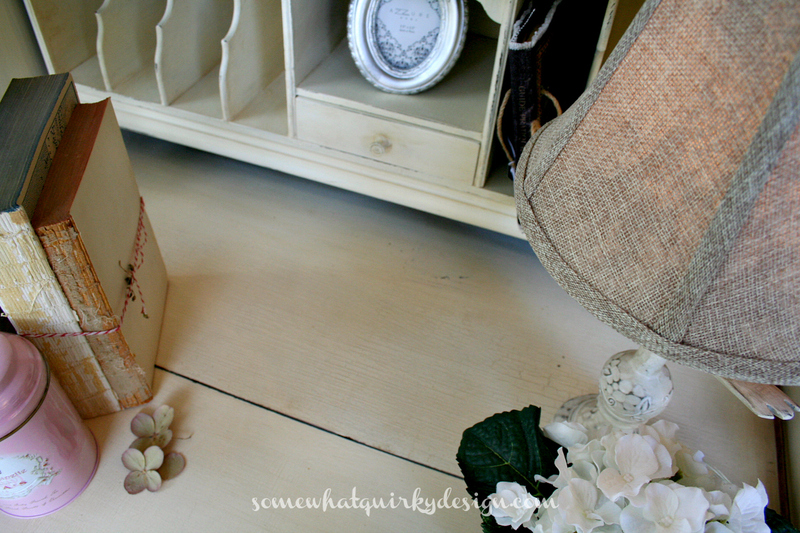 I distressed it and meant to use a little Annie Sloan Dark Wax, but I couldn't find mine! 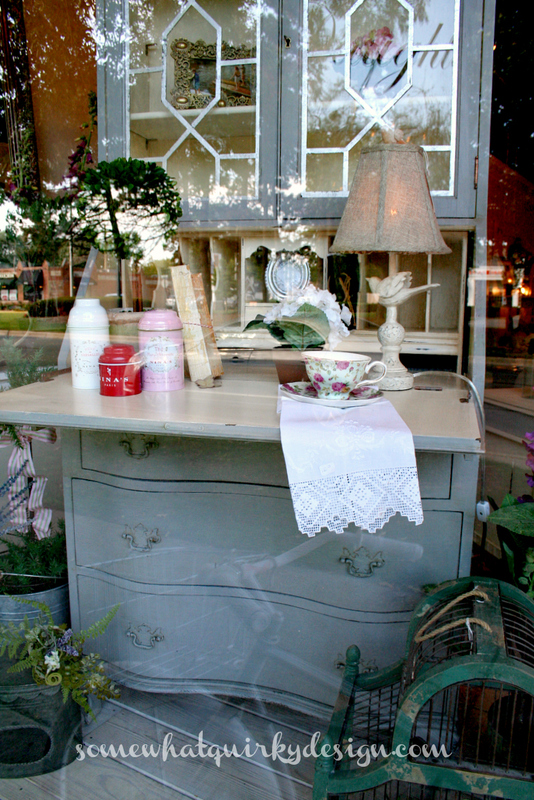 I took it to Vera's Daughter to sell and it ended up in the window before I could get my pictures taken! 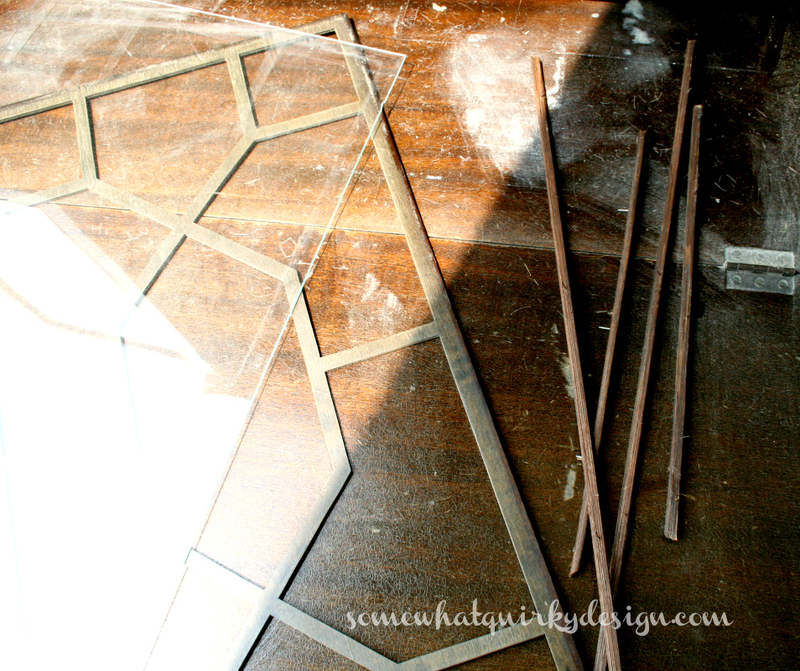 I just realized that I forgot to mention the best part - that I decided to silver leaf the fretwork from the glass doors. I'm a fan of the painted hardware. And I love the crackling that I got. I got a lot of good crackle on the inside as well. I decided to go for a pretty "dirty" distressed look on the inside so there wouldn't be issues with having to keep it clean. I couldn't find the finial that goes here, but I have since and I need to get it to the store and put it in place. I think she's beautiful from top of her head to the tips of her toes. You want her, don't ya? Nicely done! And I hate painting the inside of cabinets. Ugh. Oh she is beautiful and I love taht silverleafing! I have an old desk and the cubby holes are what I am not looking forward to painting! Hope mine turns out half as good as yours girl! Karen, you did a fabulous job transforming your secretary! I think the silver leafing on the fretwork makes it look like leaded glass. 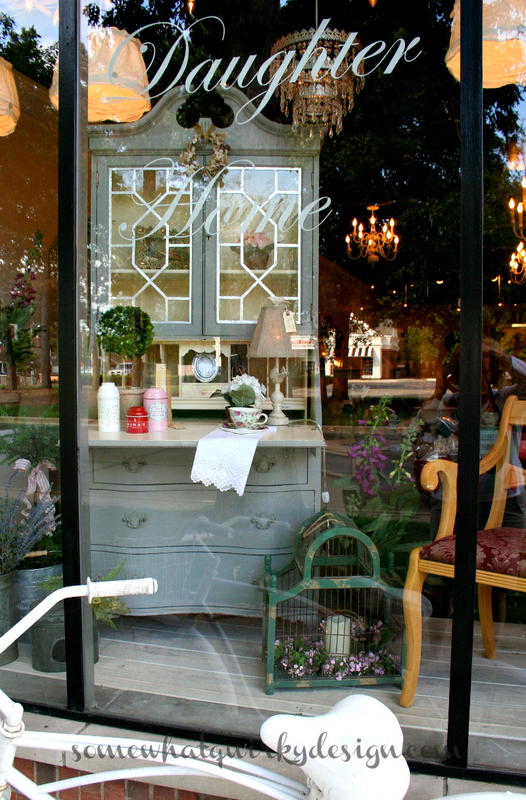 It sure is the star of the window display! Karen, she IS beautiful! Truly. And yes, I think the silver leafing on the fretwork makes it. My sister finished a small desk this past spring with cubbies like yours, and also commented on the frustration of reaching those. I hope you get an appreciative buyer and good return for your time and labor spent on making it beautiful. I would certainly appreciate it. 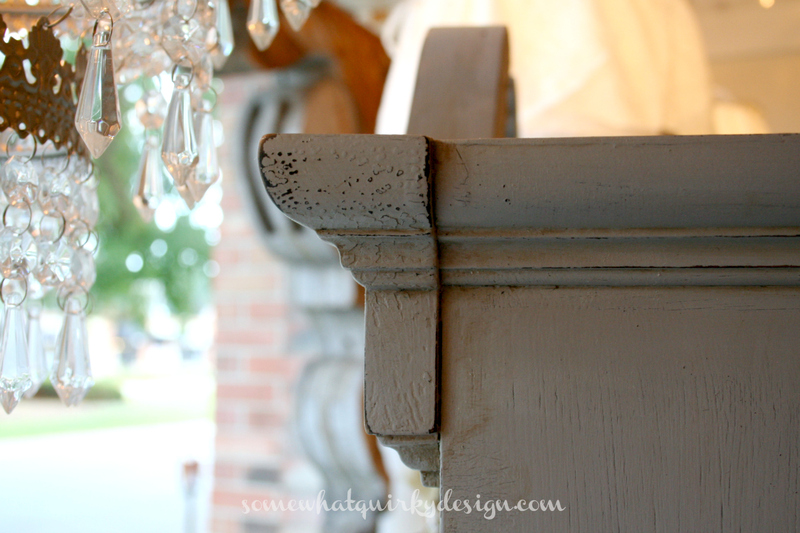 I really like the two tone but please reconsider your painted hardware thing. You are robbing that girl of sparkly jewelry! Think of how great silver leaf would have been. Nicely done indeed! She is gorgeous and I love the silver leafing! Don't think she'll stay in that window for long. I can see a big, 'sold' sign on her. I would love to have a secretary. Well done, indeed! GORGEOUS!! Makes me second-guess that I passed one up this summer. A FREE one. Dangit. What an amazing transformation! 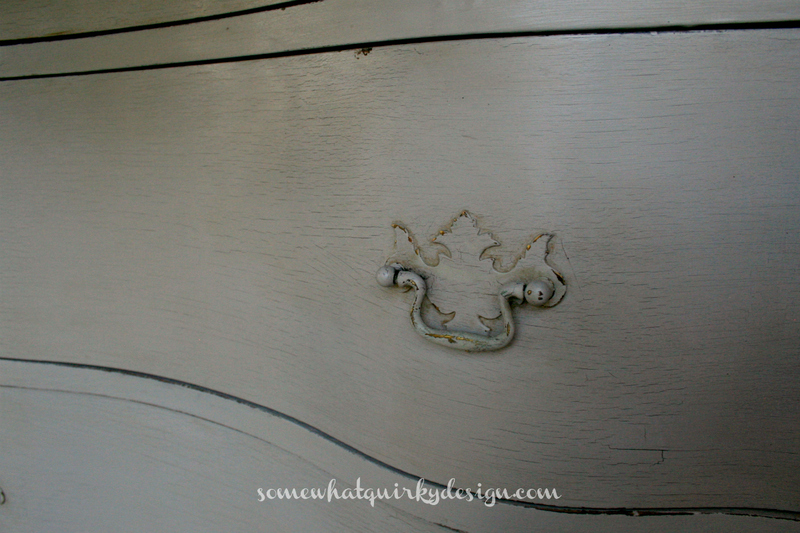 I can't wait to silverleaf a piece of furniture now - it's exquisite!!! The silver leaf added to the fretwork - brilliant idea! Love the colors and the tips along the way. She is a beauty. 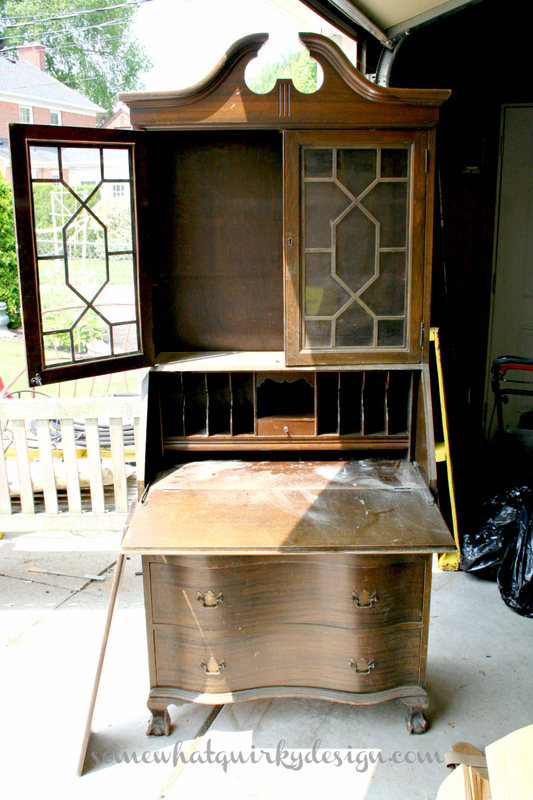 I have an old secretary that's almost identical to this one that I've been trying to decide whether or not I should paint. I think maybe you've just helped me to decide. YES, she will get a new look soon. Love yours. Thanks for sharing. Thanks for bringing this beauty over to Make It Monday! Wow Karen she is gorgeous! Great idea silver leafing the fretwork, it really adds so much to this piece. I hear ya about painting the envelope slats (or whatever you call them) such a pain and I'm going to remember your tip next time to remove the backing to access both sides - smart! I'm sure she won't stay in the store window long! Great job Karen! I love secretary desks. You did a beautiful job on this. I'm fairly new to painting furniture and you are very inspirational! Lovely LOVELY job. Beautiful! I have a secretary desk just like this one. My grandmother bought it in 1933. Maybe I will get the urge to re- finish it. Yours is lovely! so very, very pretty and I can appreciate your efforts. I too have tackled a secretary with cubbies and I also didn't take the back off. It was such a chore on the back!!! But it is almost as beautiful as yours. Silverleafing my fretwork might just put it in the same category as yours. Thanks for the fabulous idea. One question... what colour glaze did you go with? she is indeed beautiful and is sure to find a special home! bravo. 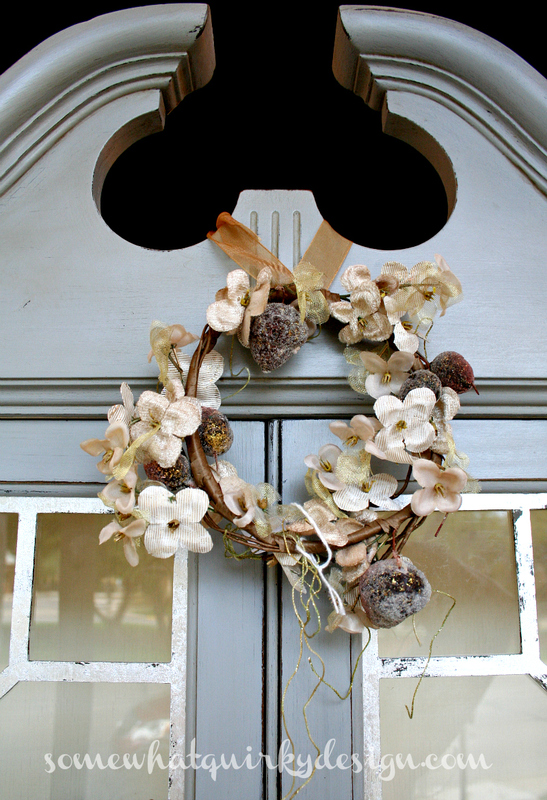 stop by when you have a moment: http://hellolovelystudio.com. She is just gorgeous! I am wracking my brain for a piece to use your silver leaf idea on but can't think of anything... maybe it's time for a shopping trip! Gorgeous! Gorgeous! I thought I was the only one that stuck furniture in the back and left it there for a long bit--LOL! Karen what a beauty she turned out. Yes I want her. Wonderful what you have done. It's simply stunning! A real piece of work to paint though! I already have one of these vintage secretary's in my bedroom. I'm going to add the gold leaf to the fretwork. I am interested in your input on a new project. I need large nightstands for our basement guest room. The size of the three drawers on the bottom are perfect for both nightstand and clothes storage for guests. The room is tight, so I can't put in a chest of drawers too. The measurements on this secretary are perfect...however, I want to take off the top of the piece, including the fold out desk. Having taken it apart, do you think this is doable? I will paint. I've see others remove the top, but not the fold out desk part too. I have a headboard already to paint. The room has a foundation wall that juts in about 8 inches. I am toying with the idea of using the removed hutch by placing it on the foundation wall, centered above the headboard. I'll get two secretary's, one for both sides of the bed. Does that make sense? JHahn, this answer is for you... I had a whole email written for you and finally noticed that there was no email address. I have some pictures in the email which I am not certain will copy or load here, but I'm going to try . . .
Wow. That's a lot to think about! Hmm. I've never taken the top off of a secretary before I'm not even certain how I would do that. I've seen secretaries used as bedside tables before, but just on one side of the bed. My thoughts on the top half sitting on the foundation wall - I don't think it would look good over the bed. It would probably look better above the desk that you took it off of. If I am envisioning everything correctly, this is what I would do - use intact secretary on one side of the bed. Have a small stand mirror so that it could be used as a vanity. Of course you would want a small chair available. 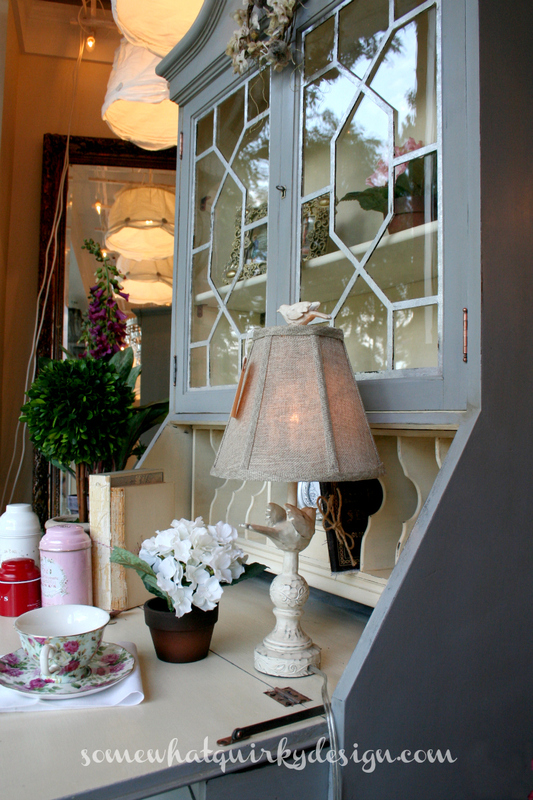 On the other side of the bed use a 3 drawer dresser with a tall mirror over it, because guests need a large mirror. If you think that 3 drawers is enough for a guest (I do) a tall side table would work as well. One with a lower level shelf would be good. It would need to be fairly substantial to balance out the secretary. This is where you would put a large lamp. I guess the height of the table depends most on the height of your bed. But better that it be taller than the bed than shorter. Plus you do have to the "weight" so that one side of the bed does not dwarf the other, or make it feel like the whole room is going to tip over because the sides are out of balance. Ok. The pictures did not load. If you want to see the pictures, just reply again with your email address. Thank you so much for your quick and extensive reply! This is gorgeous. I just bought one and want to paint it. What steps did you take before painting it? Did you sand it and primer it? Did you use any liquid strippers? Thank you.